Wed., June 15, 2016, 8:09 p.m.
CLEVELAND – For all the criticism of Golden State’s Draymond Green and his penchant for committing flagrant fouls during these playoffs, Wednesday may have brought the harshest words yet. 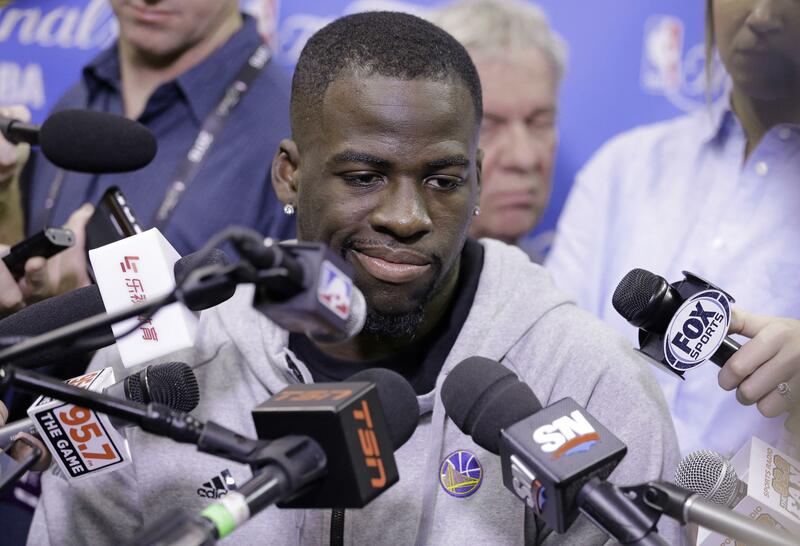 Saying he let the Warriors down and that he was a “terrible teammate,” Green spoke on how it pained him to be suspended for Game 5 of the NBA Finals – and how he will make amends Thursday night in Game 6, when the Warriors visit the Cleveland Cavaliers and get a second shot at winning what would be their second straight championship. Golden State leads the series 3-2, but now knows it will play the rest of the series without starting center Andrew Bogut because of a left knee injury. Green – who missed Game 5 because of how many flagrants he has accrued during the playoffs – will be called upon to play some center in Game 6, as he has plenty of times in this postseason already. This series is back in Cleveland largely because LeBron James and Kyrie Irving could not be stopped in Game 5, when the Warriors’ best defender was watching the Cavaliers’ star duo score 41 points apiece from a suite at the adjacent baseball stadium that the Oakland Athletics call home. Green alone could not have stopped their onslaught, but it surely stands to reason that life would have been more difficult for Cleveland if he was in uniform. With Green watching, the A’s won by nine. Without Green playing, the Warriors lost by 15. He’s already spoken to his teammates about his mistakes, and made clear that watching Game 5 from next door left him hurting. The straw that got Green suspended was when he took a swipe at James’ groin area in Game 4. But when asked what he expected when he sees Green in Game 6, James showed he’s only focused on bigger pictures and no mano-a-mano battle. “My only job is to get this win, man,” James said. Green met with reporters for about 11 minutes before practice, and didn’t shy away from his mistakes in these playoffs. Some thought he merited a suspension when he kicked Oklahoma City’s Steven Adams in the groin area during the Western Conference finals. The NBA upgraded the foul and fined him after reviewing that play, and when another flagrant was assessed after-the-fact for taking the shot at James a suspension was automatic. Teams have won at home in consecutive years, but to do it in the same road locale has only happened once before – the Boston Celtics celebrated on the Los Angeles Lakers’ home floor in back-to-back years, 1968 and 1969. Cavaliers coach Tyronn Lue was asked if his team might try to prod Green a bit, knowing another flagrant foul or two technicals in Game 6 would mean another suspension for Game 7. “You just play the game,” Lue said. Green, who acknowledged that he’s been working on keeping emotions in check, didn’t sound worried. If Cleveland wins, Game 7 is in Oakland, California on Sunday. If Cleveland loses, the Warriors will celebrate on the Cavs’ home floor for the second consecutive year – exactly one year to the day from last year’s clincher. And if Golden State gets to spray champagne the cramped visiting locker room at Quicken Loans Arena around again, those bubbles will likely wash away most of not all the sting Green is feeling for letting his team down. Published: June 15, 2016, 8:09 p.m.